The Rt. Hon. Lord William Hague, former British Foreign Secretary, Professor Joseph Stiglitz and other distinguished speakers and guests gathered to assess the world economy and discuss geopolitical risks. Presentations were also delivered on the infrastructure development outlook in Asia and implications of the new climate regime on the infrastructure sector. Prominent speakers included Lord William Hague, a former British Foreign Secretary; Joseph Stiglitz, a Professor of Economics at Columbia University; and Chang Yong Rhee, Director of the Asia and Pacific Department of the International Monetary Fund (IMF); Juan Miranda, the Managing Director General of the Asian Development Bank (ADB); Sir Danny Alexander, Vice President of the Asian Infrastructure Investment Bank (AIIB); and Amitabh Kant, CEO of NITI Aayog and former Secretary of the Department of Industrial Policy and Promotion in India; H.E. Felipe Calderón, Chair of the Global Commission on the Economy and Climate and former President of Mexico; Arun Majumdar, a former Undersecretary of the U.S. Department of Energy. In his special remarks, Lord William Hague shed light on geopolitical risks that particularly require global attention and their impact on the world economy. In the first session, Professor Joseph Stiglitz, a Nobel Prize-winning Economist, and Dr. Chang Yong Rhee, IMF director, presented their prospects for the global economy and discussed the short- and long-term global economic trends highlighting North America, Europe and Asia. In the following session on the Asian infrastructure industry, AIIB Vice President Sir Danny Alexander and ADB Managing Director General Juan Miranda spoke about the challenges and opportunities that the infrastructure businesses are facing in Asia. NITI Aayog CEO Amitabh Kant also touched upon India’s reforms and innovations to improve the infrastructure. The last session dealt with the implications of the Paris Agreement on industries in the era of the new climate change regime. H.E. Felipe Calderón, Chair of the Global Commission on the Economy and Climate, and Professor Arun Majumdar shared their prospects for the future low-carbon energy economy and the implications of the new climate change regime on the infrastructure business. 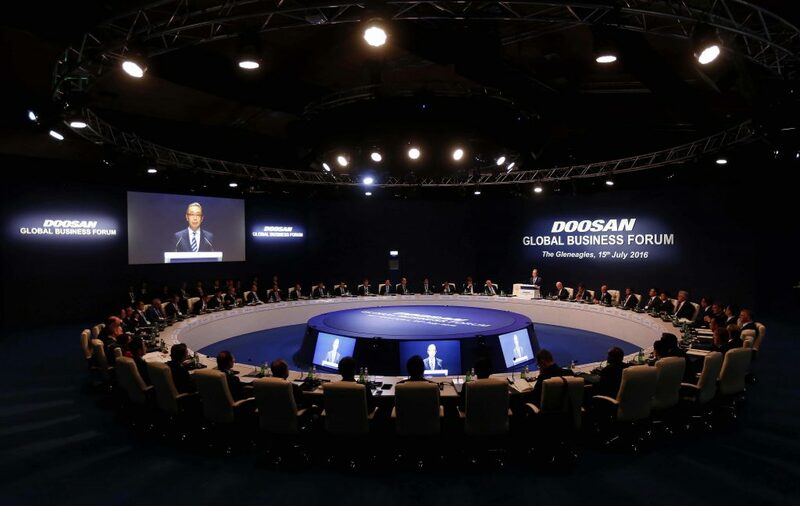 Founded in 2012, Doosan Global Business Forum has become an annual event in which global leaders including eminent economists and CEOs of multinational enterprises gather to gain valuable insights on the global business environment. Previous participants include politicians such as The Rt. Hon. Tony Blair, former Prime Minister of the United Kingdom; Lawrence H. Summers, former U.S. Secretary of the Treasury; Condoleezza Rice, former U.S. Secretary of State; and Angel Gurria, Secretary-General of the Organization for Economic Cooperation and Development (OECD), as well as influential economists, including Paul Krugman, a Professor at Princeton University; Robert Shiller, a Professor at Yale University; and Kenneth Rogoff, a Professor at Harvard University. The noted presenters also included JB Straubel, Co-founder and CTO of Tesla Motors, a leading electric vehicle manufacturer. Doosan Global Business Forum was held alongside The Open Championship, which was staged at Royal Troon Golf Club in Scotland, from July 14 – 17, 2016.